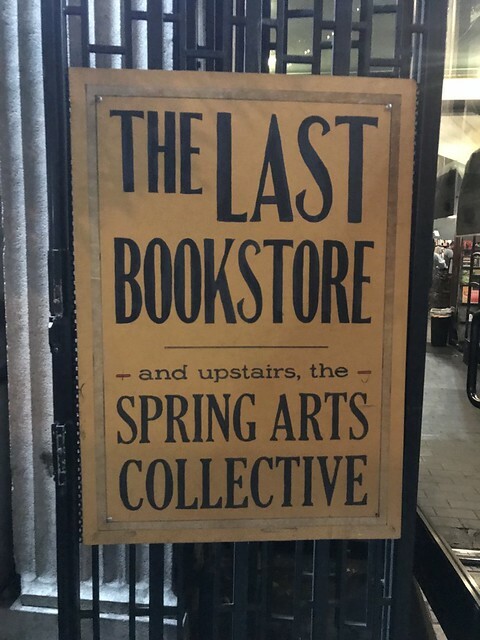 Late this evening I stumbled into The Last Bookstore, a large downtown LA store selling books as well as music, DVDs, and various other items. Much of the store was somewhat inaccessible due to author Rowan Blanchard speaking about her new book. This took up most of the main floor thanks to a sizable audience — a good thing for the store but it also meant I couldn’t explore all the shelves. Their selection goes all over the map; including classics, books on LA and California (several books on Oakland caught my eye) and even photography coffee table books which had their own separate room. The place is immaculate and mostly well organized, though some mischievous acts led me to discover unexpected books. For example on a shelf of new books about entertainment I found a used copy of Max Headroom’s Guide to Life from 1986. It’s a silly book and doesn’t attempt to reproduce Max’s digital stutter (how could you in book form, really?) but does a decent job of replicating his arrogant ignorance. Mostly I was glad to find a late night reprieve of the insanity on the streets from the NBA All Stars game. What kind of bookstore is open late? The Last Bookstore is your answer. I was glad to stumble in and find this quirky LA landmark. It served as a welcome reprieve from the chaos on the streets outside.